When it comes to basic democratic principles and the freedom of political expression, the public meeting Thursday to discuss a proposal to allow fracking adjacent to Lake Hefner was a complete sham. Democracy is NOT alive and well in Oklahoma City, folks. Although citizens here should be rightly concerned that new fracking at Lake Hefner could lead to the contamination of a major city water supply, they also should be furious that Oklahoma City officials seem intent on crushing any dissent about the proposed project with heavy-handed tactics that reek of collusion with a local oil company. 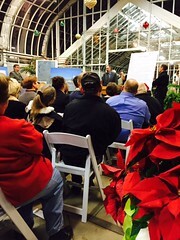 The Will Rogers Conservatory in Oklahoma City was the venue for the meeting. (A photograph of the meeting is pictured to the right.) The two attached rooms that were used for seating were far too small for the turnout, and people were initially turned away before officials announced they would hold another meeting directly after the initial meeting. By that time many people had left, although hundreds remained outside in the cold and rain protesting loudly. The sound system was so bad or adjusted in such a mediocre manner only about half of the people at the initial meeting could actually hear the presentation itself and the question and answer period. Those people that could hear were often abused by piercing microphone feedback. The presentation by Pedestal Oil Company, which wants to drill near the lake, was meandering and amateurish and seemed designed to deflect important questions. So much went wrong before and during the meeting that I need to run through it all just to get a handle on all the dissent squashing tactics used by Oklahoma City in what appears to me to be collusion between the city and Pedestal. (1) The timing of the event. The Oklahoma City Water Utilities Trust announced the meeting just a few days ago. The date for the meeting was right before Christmas, a busy time of the year when many people are traveling. Why the rush? Why not wait until after the holiday season? This was never adequately explained by Oklahoma City officials and others presenting at the meeting. Was the decision made to hold the meeting so quickly and at a busy time of the year in order to limit the expression of dissent? (2) The event’s venue. For some reason, city officials chose the Will Rogers Conservatory as the venue for the event. There was seating for perhaps only 125 people or so in the two rooms. The attendees in one of the rooms simply couldn’t hear anything and many of them left. Why such a small venue? City officials had to know, as Ward 2 Councilor Ed Shadid argued, that the meeting would attract hundreds of people. There are any number of venues throughout the city that could handle large crowds, a point made by Shadid. Did city leaders choose the small venue intentionally? How could any reasonable person not suspect this? Wouldn’t it be interesting if the city held a public meeting on this issue outside under a large tent next to a fracking site? That would take care of the crowd-size issue and be informative as well. (3) The sound system. As I mentioned before, the sound system was so bad or managed so ineffectively it was difficult for anyone to hear. Certainly, the people stuck in the “second room” couldn’t hear at all unless it was the constant, piercingly loud feedback. (This is not sarcasm.) Why wasn’t the sound system checked out before the meeting? Is this yet another example of how the city is trying to limit debate on this issue? (4) The mediocre presentation by Pedestal. The presentation on behalf of Pedestal Oil Company, which could wind up drilling six wells just south of Lake Hefner, was just simply terrible. One of the presenters, Pedestal president David Singer, began with a meandering history of himself and his company and how he cared about Oklahoma City. The vast majority of the people there wanted to hear about the proposal, not about Singer’s life or his company’s history. The company brought small amateurish charts placed on easels that were difficult to view. Certainly, people in the “second room” were unable to see them. Why didn’t they use a computer and projector and a screen like most professionals do these days? Does this apparent lack of technology prowess by the company’s top officials spill over into its operations? Is this the type of company we should allow to frack for oil and gas near and under the city’s water supply? (5) Oklahoma City officials at the meeting were inept and condescending. With the exception of Ward 2 Councilor Ed Shadid, who said he was heartbroken over how people were being treated, city officials at the meeting were inept. I will focus on Marsha Slaughter, the manager of the Oklahoma City Water Utilities Trust, who handled much of the meeting, Why didn’t she ensure the sound system was working? Why didn’t she apologize profusely for the lack of enough space? She cut people off. At one point, Slaughter referred to the “occupy people” outside in the cold and rain who wanted to get inside. This was absurd. The vast majority of the people there were local residents concerned about their homes and recreational area whatever their views on the Occupy Movement, which is hardly a major force in politics anyway. Slaughter’s comment was a huge condescending generalization and was obviously used to marginalize dissent. She owes people an apology. (6) The timeline for additional comments. People at the meeting were handed a form at the meeting, which stated the city would be taking comments on the issue through Monday, Dec. 22. That’s only four days away. That quick time frame, along with the sudden announcement of the meeting itself, can obviously be viewed as an attempt to limit comments and debate. Why wouldn’t someone against the proposal see it this way? The proposal itself is fairly basic. Pedestal would conduct some exploratory drilling just south of the lake to determine if it’s worth its time financially. If the area is viable for oil and gas drilling, the company would complete up to six wells. The wastewater from the hydraulic fracturing would be trucked away from the site. The city would receive royalties from the production. This money would be used for improvements at city recreational areas, including Lake Hefner. In the fracking process, water laced with toxic chemicals is injected by high pressure into rock formations to release fossil fuels. The wastewater from the process is usually injected by high pressure into what are known as disposal wells, a process scientists believe leads to earthquakes. The movement against fracking continues to grow. In two recent related actions, the city of Denton, Texas, recently actually voted to ban fracking in its city limits and New York Governor Andrew Cuomo has announced he will ban fracking in his state. Some questions that Pedestal has not answered publicly and thoroughly is why it wants to drill near Lake Hefner in the first place. Is it more financially feasible for the company to drill there than somewhere else? Is that area especially rich in fossil fuels? Why aren’t more companies vying to drill there? Why drill now when there’s a world oil and gas glut? er, should be this: Why risk the city’s water supply? Pedestal’s proposal must first be approved by the Oklahoma City Water Utilities Trust board and then the full Oklahoma City Council. Unfortunately, given Thursday’s meeting, it seems like a done deal at this point. Why didn’t Mayor Mick Cornett attend this important meeting? Is he in favor of the proposal or not? Shadid, a local physician who lost a mayoral election bid, tried to calm the crowd inside and outside Thursday. He indicated in a brief talk outside in the rain and the cold as people still remained locked out of the meeting venue that he might put together his own town hall on the issue. That would be helpful, but has the decision to drill already been made? Let me end with this: If you want to email the Oklahoma City Water Utilities Trust with your comments on this issue, you can do so at ocwut-support@okc.gov. Fittingly, right now, if you go to the trust’s site on the issue as I write this, the email address is given erroneously as ocwut-suppport@okc.gova>. Mediocrity and collusion have always had a symbiotic relationship.